Organizers of an effort to recall Governor Scott Walker say they have collected more than enough signatures to make it happen. 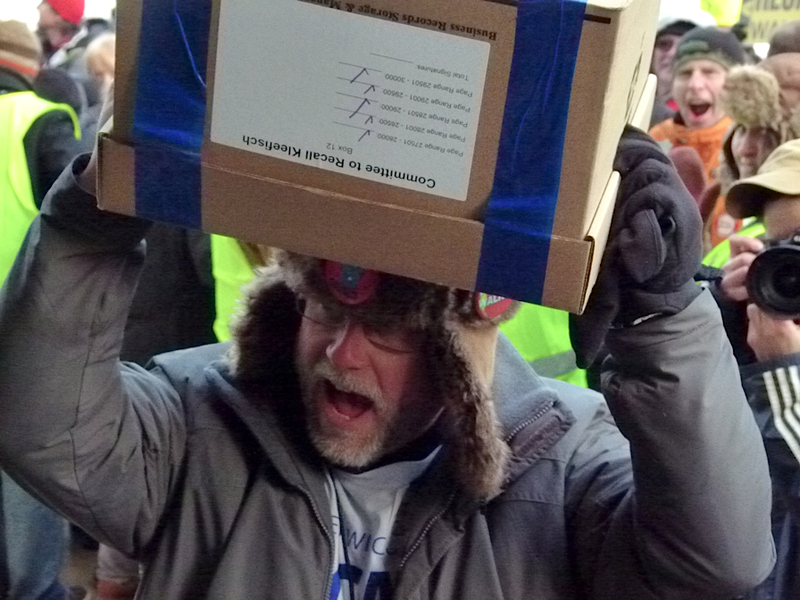 On Tuesday afternoon, over one million recall petition signatures were delivered to the Government Accountability Board. Only 540,208 valid signatures are needed to trigger a recall election. Also submitted Tuesday were more than 845,000 petition signatures to recall Lt. Governor Rebecca Kleefisch and what organizers say is more than enough signatures to recall Republican state Senators Scott Fitzgerald (R-Juneau), Terry Moulton (R-Chippewa Falls), Pam Galloway (R-Wausau), and Van Wanggaard (R-Racine). The submitted petitions will now be reviewed by the GAB, which will have to scan each page and verify the validity of signatures. Agency officials expect the process to take more than two months, putting the actual date of a recall election likely into the summer.